On the second day of the weeklong Jornadas de Filosofia, seminarians splashed some colors on the festivities as they interpreted the celebration’s theme in the Poster-Making Contest at the seminary’s Tomasino Hall last April 2, 2019. Br. John Vincent Catargo, a Grade 11 seminarian who represented La Fraternidad de Sto. Niño, bested eight other participants from the Senior High School and College levels who represented the other fraternities. “The goal is not really to compete with other teams but simply to apply what we’ve learned in our arts and philosophy courses,” said Academics Committee chairman Br. Juny Basalo. Declared as second placer was Br. Alvin Laserna Jr., a Grade 12 seminarian who represented La Fraternidad de Cristo Rey del Universo. His fellow fraternidad member, Br. Shaon Allen Abaraham, also won the 3rd prize. Active participation from the non-winners, namely: Br. Sean Cass Alvarez and Br. Eljann Tutanes from La Fraternidad de Jesus Nazareno; Br. Jhud Louiesse Pajaron from La Fraternidad de Sto. Niño; and Br. Jos Albert Aguana and Br. Juny Basalo from La Fraternidad de Divina Misericordia were also recognized. Br. Basalo said the contest was not just a mere application of philosophical concepts in arts but also an expression of the seminarians’ thoughts on the things that are happening in the country today. The board of judges consisted of Humanities teacher Ms. Maria Teresa Mañalac; together with Fr. Ken Oliver Lao, OAR; and Fr. Federico S. Gregorio, OAR. Photo Caption: Br. 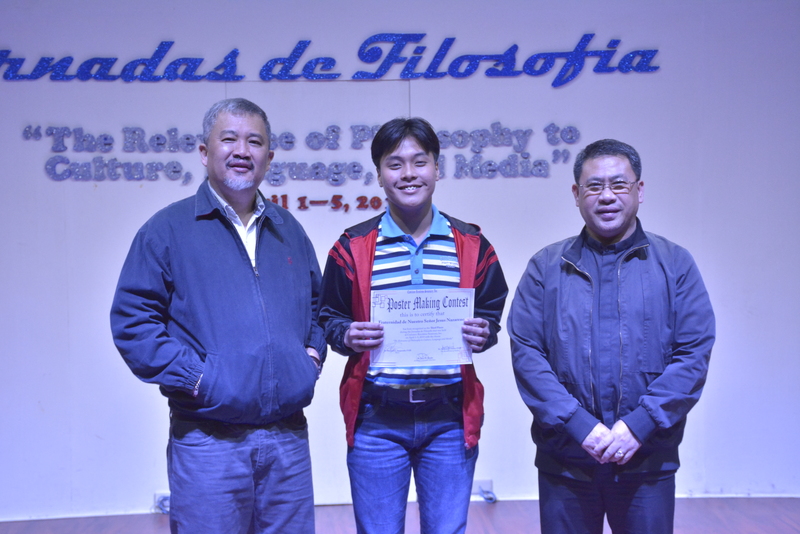 John Vincent Catargo wins the poster-making contest of Jornadas de Filosofia 2019.